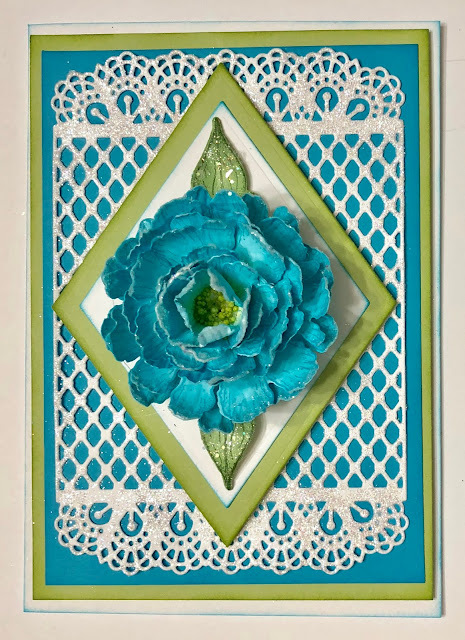 Sweet Peony to create this card for you. Instructions: Card size is 6 3/4 x 4 3/4”. It can be used as a top fold card or a side fold card. Cut white cardstock 9 1/2 x 6 3/4”, score and fold at 4 3/4” on the long side to create card base. Ink with Forget-Me-Not ink. 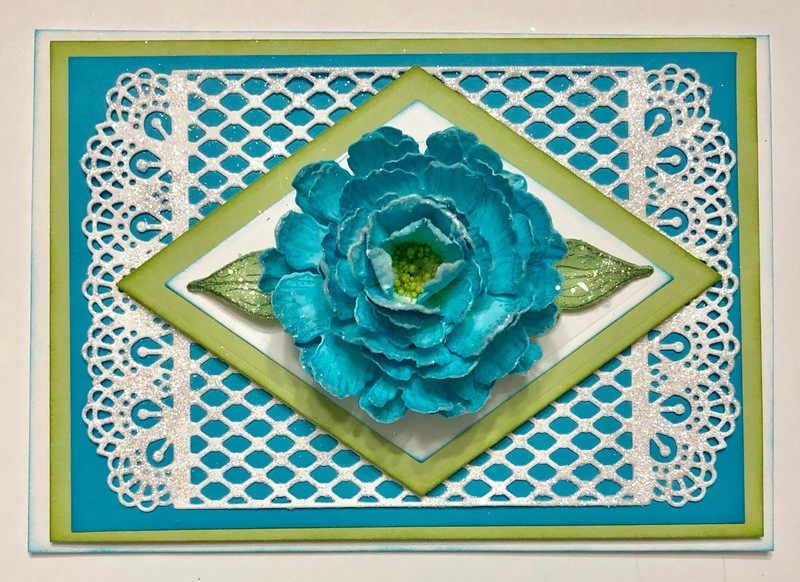 Cut green cardstock 6 1/2 x 4 1/2”, ink with Leaf Green ink, cut turquois cardstock 6 x 4” and ink with Forget-Me-Not ink. Adhere together with dries clear adhesive and adhere to card base using dimensional tape. Diecut the Diamonds and Lace Die from white cardstock, sponge with dries clear adhesive and sprinkle with translucent crystal glitter. When dry, adhere to card base using dries clear adhesive. 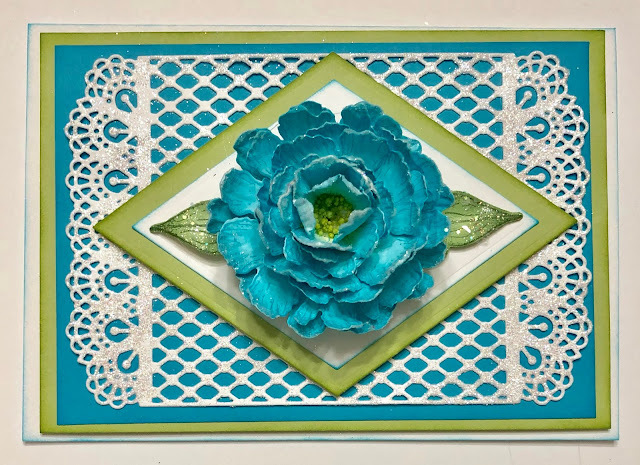 Using the Diamond Basics set, diecut celery green cardstock, ink with Leaf green ink. Diecut a smaller diamond from white cardstock and ink with Forget-Me-Not ink. Adhere the two diamonds together using dries clear glue and adhere to card base using dimensional tape. Stamp the leaves on floral paper using Ranger Olive Archival ink and color using leaf green and olive inks. Diecut using coordinating dies and shape using the Deluxe Flower Shaping Kit. Sponge the flower and leaves with dries clear adhesive and sprinkle with Rajni Chawla’s Crystal Clear and adhere to the card base as shown using hot glue. 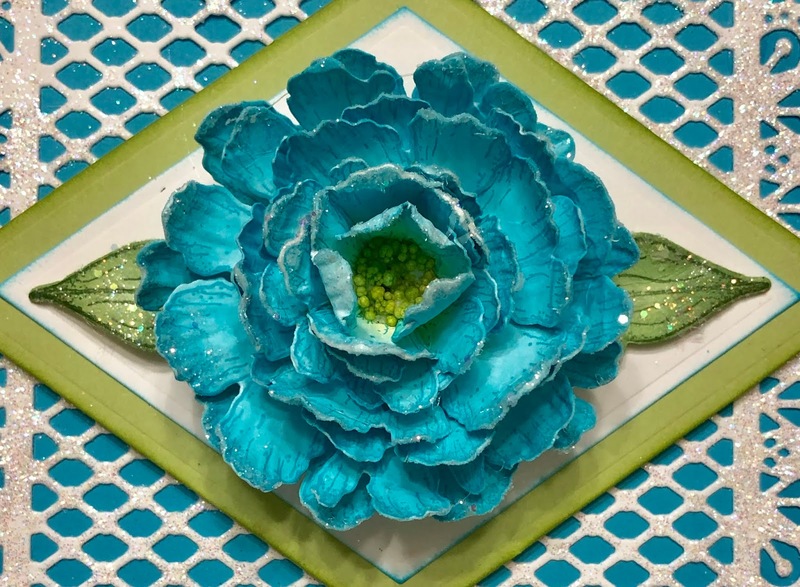 Be sure to stop by the Heartfelt Creations Blog to see all the gorgeous projects created by the super talented design team. Just gorgeous! Loving that gorgeous flower! You knocked this one out of the park....gorgeous! Turquoise is one of my favorite colors!! Beautiful card my friend!